You will listen to or watch a presentation of no more than 30 minutes. After a 15-minute question-andanswer period, you are to write a feature story according to the instructions given by the moderator. You will write the story as if it were being published in a school newspaper or yearbook. You will have 70 minutes to write, rewrite and complete the final entry. The final copy should not exceed 350 words. Attention-grabbing lead; feature style as opposed to breaking-news style; colorful details; use of direct quotes and anecdotes with substance; copy that appeals to the readers’ interest; emotional impact of copy; accuracy; completeness; elimination of extraneous material; elimination of libelous or privacy invading statements; use of AP style; skills in areas of grammar, spelling, punctuation, capitalization, etc. Fact sheet, assignment sheet, rule sheet, final copy cover sheet, writing paper, paper clips or stapler. Writing utensils (pencil or blue or black pen). 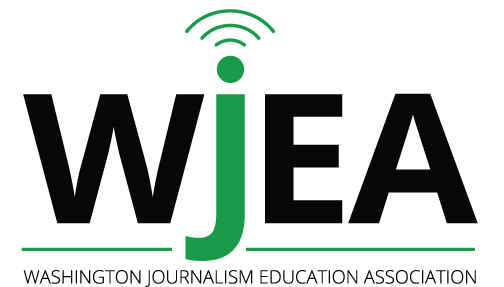 Optional: scratch paper, print dictionary/thesaurus, print AP Stylebook, WJEA’s “AP Style Cheat Sheet,” available on WJEA.org. NOTE: We regret that no electronics may be used in this contest, including phones, tablets or laptops. REMEMBER: Stay in the room during the contest. If anyone leaves the room before his/her entry is submitted to the contest moderator, the entry may be disqualified. No contestant will be given additional time, regardless of the state the work is in at that time.